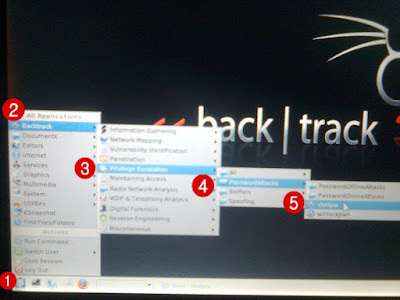 2.Backtrack:It is one of my fav,it is a multi-functionality tool that is used for software cracking,wireless hacking,penetration testing,password cracking..etc.When it boots in one can see a linux based interface and it is typically a GNU/Linux based.It is also a freeware(DOWNLOAD HERE). 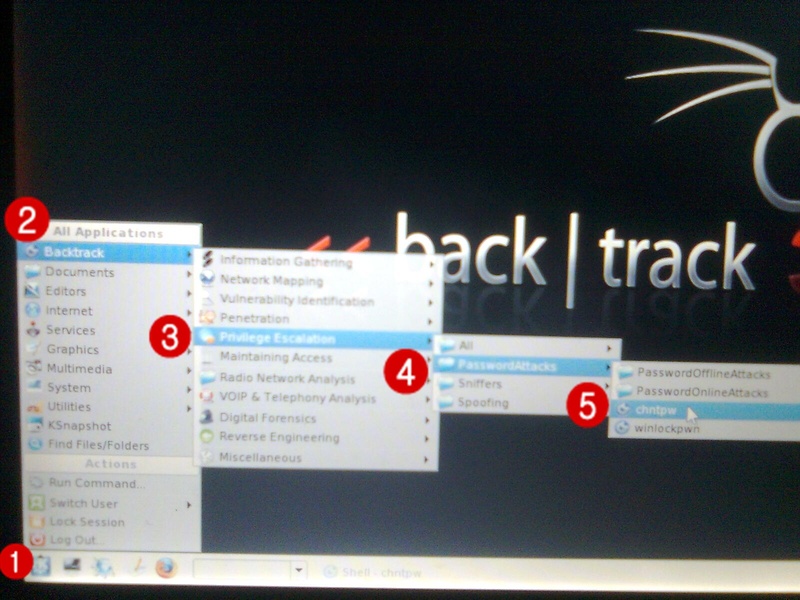 Quoting Kevin Mitnik-"I wish i had Backtrack-3 many years ago.It would have saved me lot of time." Well,after reading the above quote by the great Kevin you must have imagined the functionality of backtrack.So,before going into the article i want you all to go through the Disclaimer. 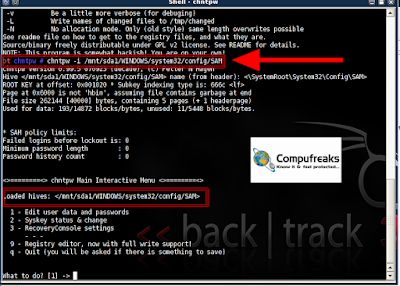 Finally we should start......i should mention that we will hack using Backtrack3......though version 4 is available and you can use it. 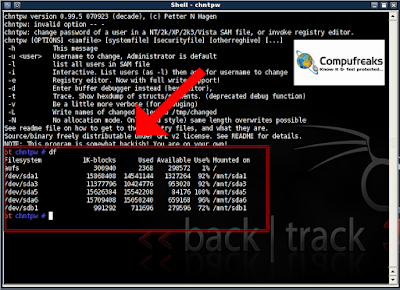 1.I hope you all have downloaded the .iso file of Backtrack from the above link(Always use official link). 2.You can burn it to a DVD/CD(make bootable) or boot it from USB,i would prefer using USB. 3.For booting it from USB you need to make your USB a booting one,for that you will need UseNetbootin(DOWNLOAD).....and use the instructions given here. 4.Now i hope you have come up with a bootable USB with Backtrack loaded in it,now restart your system with USB plugged and then go to the boot menu and select boot from USB....and leave it....you will be guided to the backtrack desktop screen as shown below. 5.Some times you may need Root ...Username:root & Password:toor. 6.Now open up chntpw by clicking on the start button as shown in the image below. 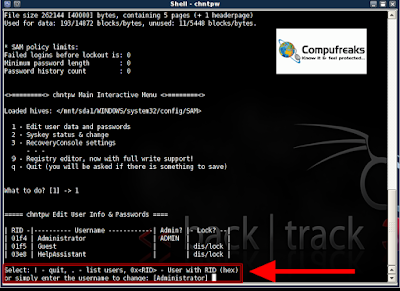 7.Then you all can see a command window will open up....now inorder to proceed you need to know the different partitions in your harddisk,so for that type "df"(with out quotes)hit enter and it will show different partitions as shown in the image below. 8.Select the partition where the system files are loaded....here in my system it is in "sda1" so i will be using it in my further steps. 9.Now type in this chntpw -i /mnt/sda1/WINDOWS/system32/config/SAM and hit enter. Note:All the characters in the above command are case sensitive. Why we used this command? Because all the passwords in Windows Xp are stored in SAM file which is located in the above specified location and the SAM file is encrypted with LM hashes and sometimes a key is provided. As it has taken "Administrator " as default value as you can see in the above image so again hit enter. 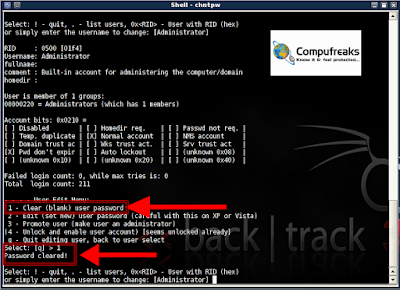 11.Here you can see there are many options you can choose any one from the list by typing that and hitting enter.I have chosen option "1" which says "clear (blank) user password". Now as you can see the "password cleared !" message has come up so,lets check again. 12.Hit enter again to get the confirmation message as shown below. So,the hack is successful!!! as you must have felt that hack using backtrack is purely command based....so remember few commands and it can work wonders for you. If you liked this hack then do drop your comments and give your suggestions on it they will be appreciated!!! Hey thanks for this tutorial :) keep up the good work. Enjoy visiting your blog. nice post yarr....everything is here......no need to go to any othere website....great work....keep it up..
tanks buddy you are really a nice guy first time i have visit on your site. can u please tell me is it possible to hack windows xp without using any software. yeah I agree with you partly...it is not that we cannot find partitions using "df"...yes we can you need to have mounted your system drive..... but i agree that "blkid -L" can be used but i felt "df" will be easy to remember and use for noobs.The main function of "df" to to find the free spaces in files but I found it very handy you can also use "fdisk -l"
Does this work on Windows XP PCs connected on the college network? 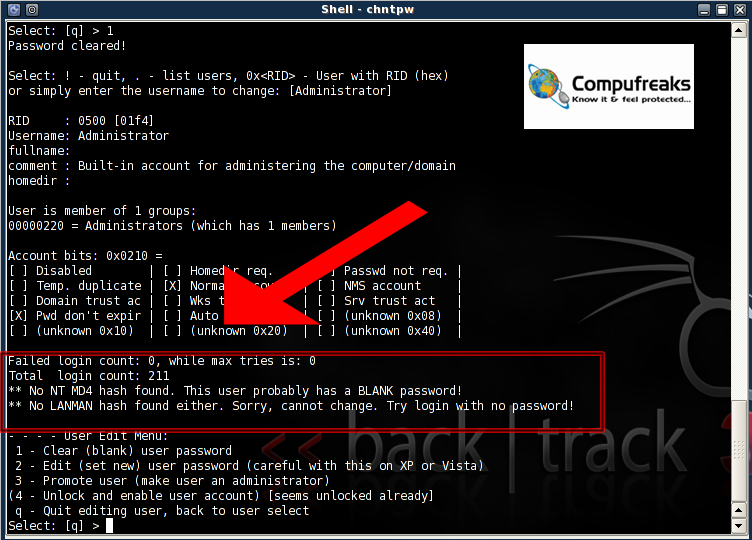 i worked as you told but unable to change the password instead all logins are invalidated. can you tell me about SYSKEY . could you please mail me the commands of backtrack.